What’s kitchen character? It’s the idea of using one unique element to make a kitchen memorable. Too often these days I see kitchens that are sadly cookie cutter. They often look so similar they become formulaic whether they are the classic all-white kitchen, black and white, wood tone, or one of the popular muted colors such as gray or pale green. Creating kitchen character can be surprisingly easy. It does take thought, a desire for something a little different than what’s on pinterest or instagram, and the courage to go for it. Here are some ideas I’ve been saving that may provide inspiration. 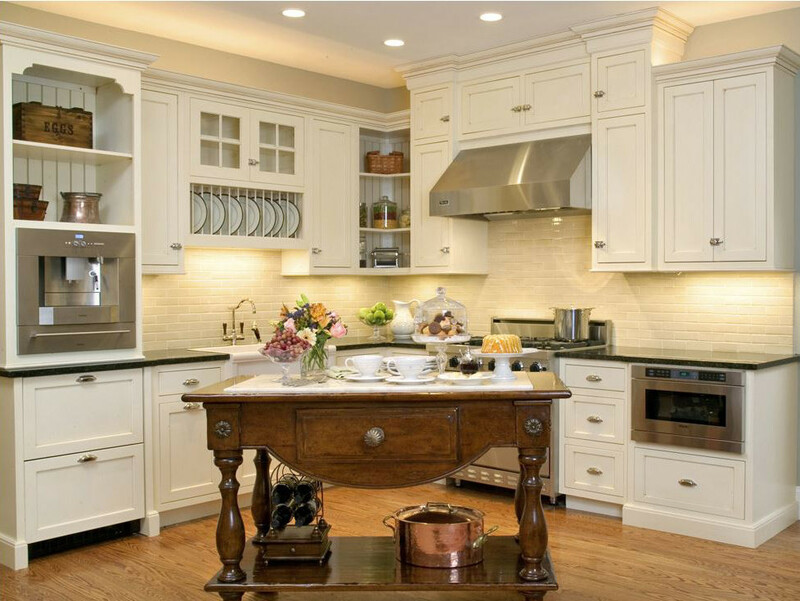 Antique furniture provides instant kitchen character. In this elegant but fairly standard black and white kitchen, the glistening old wood table, with it’s pot shelf and lovely detailing, is the one feature that helps set the look apart. Vintage flour sack pillows and upholstery ran its course a few years ago. 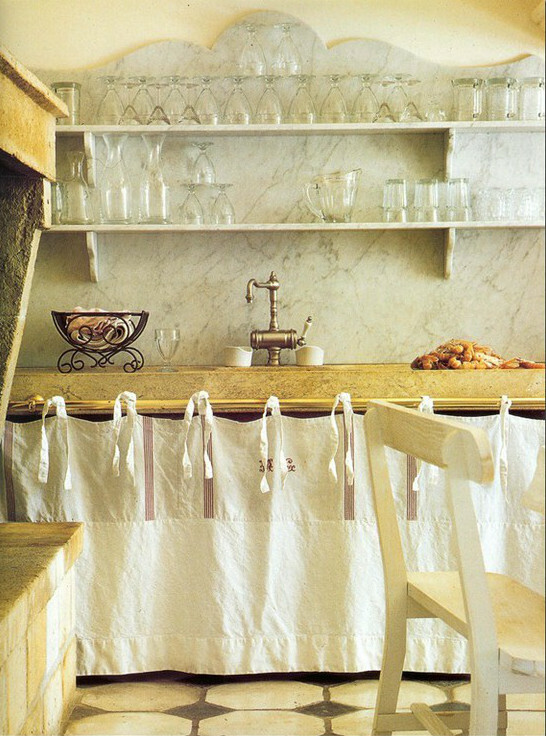 But heirloom monogrammed French dishtowels, reworked and repurposed as a cabinet skirt, are practical durable and so-very-country. This skirt was assembled from a mix of the typical red-bordered towels on top, pieced together with a remnant of a métis (half-linen, half cotton) bed sheet on the bottom. Double strips of métis act as ties that allow it to slide along the brass rail. Simple, clever, functional and unforgettable, non? 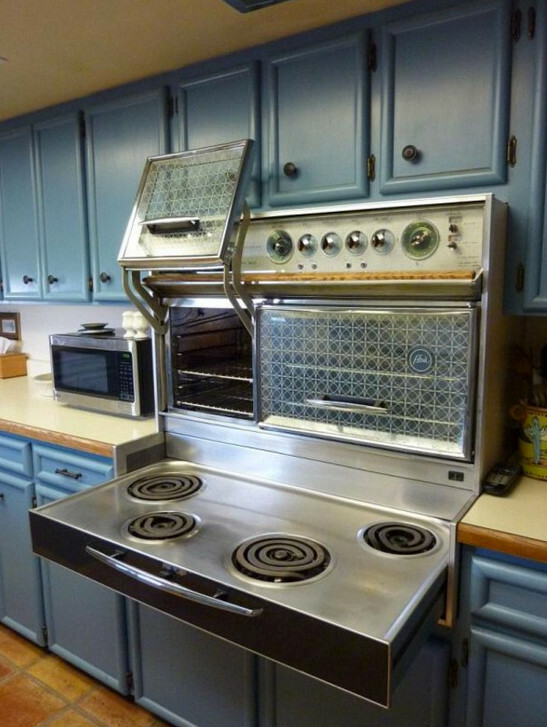 Mid-20th century electric ranges like this 1960 Frigidaire Custom Imperial Flair add hipster coolness to the kitchen. The idea burners in a drawer that can be stowed away and oven doors that flip up should be ripe for revival! The range has a distinct look that is also prized as classically modern. The fact that coil burners are horrendous to cook on must be accepted if someone goes for vintage electrics. Sad but true. However, there are brands such as Chambers or O’Keeffe and Merritt which are rebuilt gas ranges that often come in crazy colors. Taking on a vintage range is always a project and an offbeat choice. But many owners love their golden oldies. When someone is fortunate enough to have interior brick walls, why cover them up? 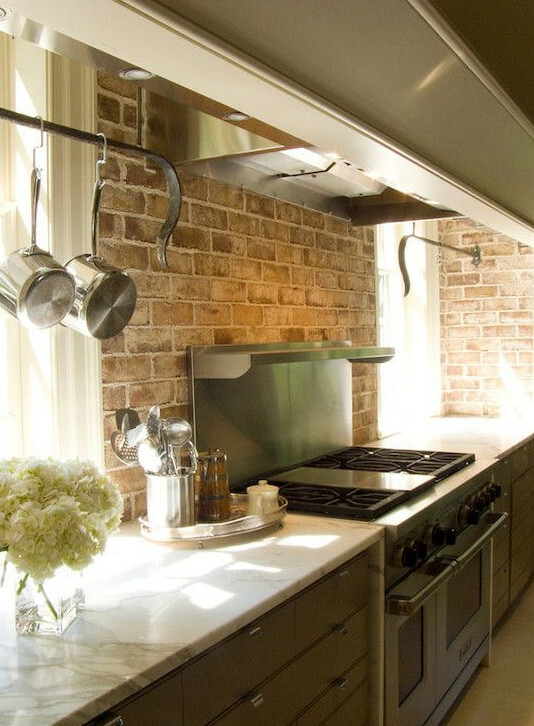 These were regrouted and used as the backdrop for a wood-theme kitchen that gets a wonderful warmth from the brick tones. The choice of calacatta marble counters, with their caramel-colored marking, is an ideal visual link between cabinets and brick. The antique hutch in this kitchen is crazy big and elaborately carved. And it’s completely out of style in terms of antique furniture — somewhat dark and heavy. Combining it with minimalist stainless steel in a small kitchen allows it to dominate visually. What’s deceptive though, is how much it can hold, particularly on the bottom where there are three paneled doors. 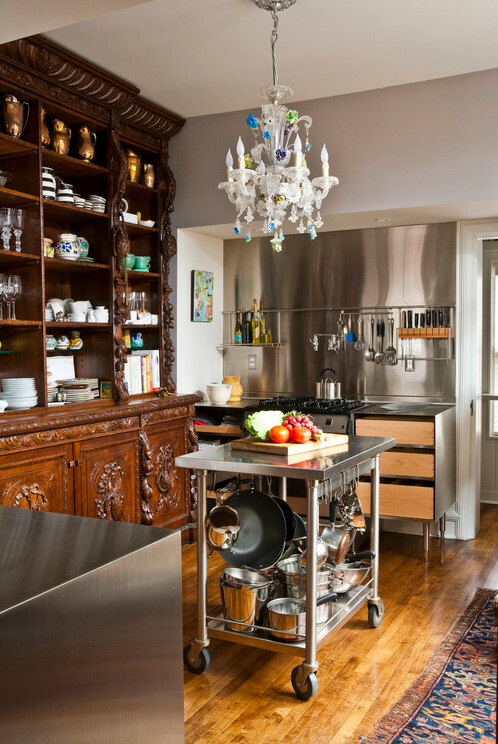 I love this really odd pairing, perhaps because I love stainless and antique furniture equally in a kitchen. New York designer Friederike Kemp Biggs layered the colors of the cabinets in her New York apartment with black over light blue plus gilded borders. It’s an antique or “ebonzied” look and — love it or hate it — the result is unforgettable. 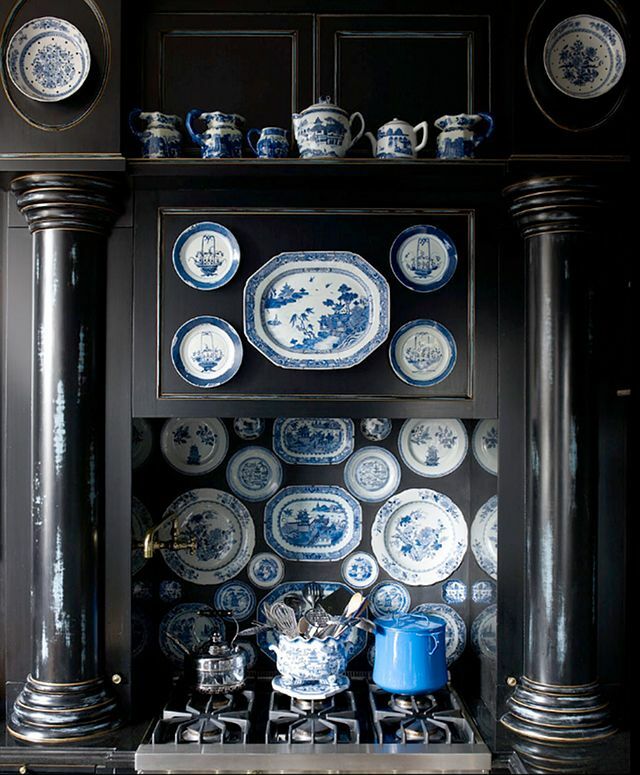 Then traditional blue and white ware was massed together on the range guard, on the front of the hood, and on the shelving above. It’s a bit like wearing a ton of jewelry to change the look of black dress and it sends a message that the owner doesn’t cook very much. But in shiny, all-black apartment kitchen, accessories rule and cooking is likely beside the point, at least in this case. You also might enjoy Vintage Gumwood Cabinet Kitchen.